Compiled by Middle East Forum web editor and research fellow Gary C. Gambill. A Saudi-led coalition of Sunni governments began pounding Yemen late last month to combat a takeover of the country by Shiite Houthi rebels. While the rapidly escalating regional military conflict in Yemen has taken many outsiders by surprise, the Middle East Forum has been closely following the deteriorating situation in the southern Arabian peninsula for years. For an informed introduction to the issue, we recommend the following selection of articles by Middle East Forum staff and fellows, and by specialists who have written for our flagship publication, Middle East Quarterly (MEQ). For background on the Shiite Houthi insurgency in Yemen and Saudi Arabia's first intervention in 2009, we recommend Lucas Winter's 2012 MEQ article, "Riyadh Enters the Yemen-Huthi Fray." Lucas concludes that "a protracted power vacuum in Yemen will pave the way for increased foreign meddling." 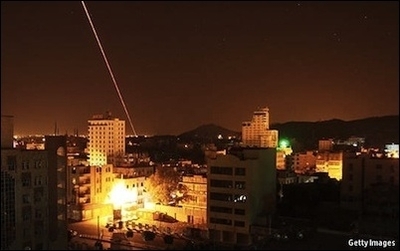 In a December 2011 American Spectator article," The Coming Collapse of Yemen," MEF fellow Aymenn Jawad Al-Tamimi warned against misinterpreting growing civil unrest in Yemen as a people-vs-government "Arab Spring"-style uprising, while ignoring the country's ethno-sectarian complexity. MEF fellow Jonathan Spyer explains Iran's role in Yemen in a November 2014 PJ Media article, writing that the Houthi rise to power there is "testimony to the unsurpassed skill that the Iranian Revolutionary Guards Corps displays in the practice of political and paramilitary warfare in the Middle East." Aymenn Jawad Al-Tamimi examines the domestic drivers of the Houthi rebellion in his September 2010 article, "Focus on Yemen, Not Israel-Palestine." The revolt is "rooted in a rightfully perceived lack of sharing-of-power and oil wealth for the inhabitants of the north of Yemen, rather than as a religious dispute," he writes. "The Houthis thus have legitimate grievances that can be easily addressed." Although Sunni jihadists in Yemen are predominantly loyal to Al-Qaeda in the Arabian Peninsula (AQAP), Aymenn Jawad al-Tamimi has tracked the emergence of factions loyal to the Islamic State group (IS, or ISIS). For the latest, see our February 16 - March 15, 2015 collection of his research. Most MEF staff and fellows see Saudi King Salman's intervention in Yemen as a positive development. MEF President Daniel Pipes is cautiously optimistic, writing that "Salman's skilled diplomacy and his readiness to use force in Yemen responds to the deadly combination of Arab anarchy, Iranian aggression, and Obama weakness" in a March 28 Washington Times article, "Why Yemen Matters." David P. Goldman, a Wax Family Fellow at MEF, argues that the intervention is a "welcome" development. Robert J. and Abby B. Levine Fellow Tarek Fatah dissents from this view in his March 31 Toronto Sun op-ed, lamenting that "the richest nations of the Arab world are pummeling one of the poorest people on earth" in a war that has more to do with corruption and sectarianism than fighting the elephant in the room - ISIS and like-minded Sunni jihadists. This is line with a long-running debate over whether the (non-Sunni) regional Iran axis or the ISIS proto-caliphate represents the greatest threat to U.S. and Western interests. Related Topics: Persian Gulf & Yemen, Saudi Arabia, US policy receive the latest by email: subscribe to the free mef mailing list This text may be reposted or forwarded so long as it is presented as an integral whole with complete and accurate information provided about its author, date, place of publication, and original URL.